Who’ll survive with fewer losses – the blues or the yellows? The above charts are from the presentation by Professor Colin Rallings at the briefing on the May 3rd local elections organised by the Political Studies Association. Each year Rallings, together with his academic partner at the University of Plymouth, Michael Thrasher, compute a national equivalent vote share based on the local election results. 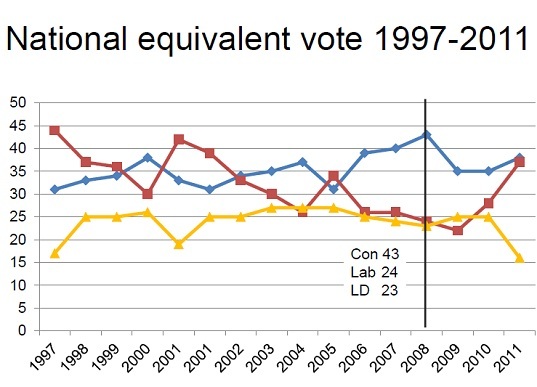 The top chart shows the trend since 1997 which illustrates vividly why the 2012 elections hold such promise for Labour. 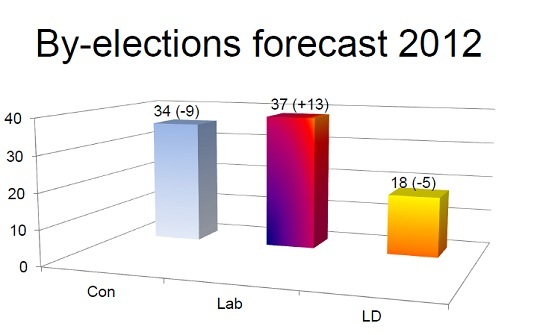 For local council elections generally follow a four year cycle so the starting point in just over a fortnight’s time will be the CON 43/LAB 24/LD 23 of 2008. Another regular computation that R&T produce is a projection of the national equivalent vote share based on the local council by elections result – contests which are held throughout the year. This is not the final forecast for May 3rd. R&T might be putting out revised figures in the light of elections taking place today and next Thursday. Officially Labour is saying that it “expects” about 300 gains on May 3rd which, surely, underplays their potential by a huge amount. The Rallings figure is 700. An interesting battle is in prospect between the Tories and Lib Dems and on the face of it the yellows should do better. Clegg’s party is down 5 on 2008 while the Tories are down 9. So if this is correct it equates to a CON>LD swing of 2%. One thing not factored in is the huge rise in the polls for UKIP. In the 800 or so seats where the purples are putting up candidates you’d expect them to do well. If the Tories suffer disproportionately then that could add to the party’s woes.